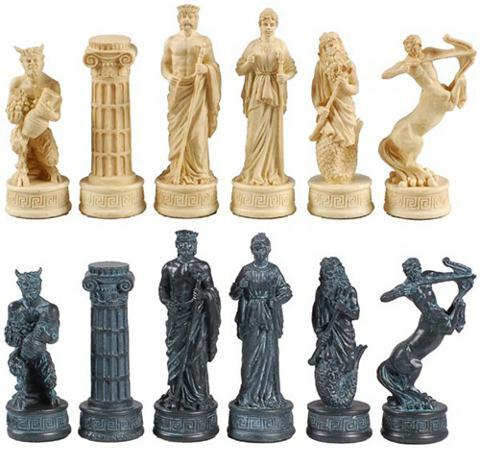 The Chess Set of the Gods are chessmen of the Greek Mythology from Ancient Greece and Homer's Iliad and Odyssey. Admire this nice set of the Grecian gods and goddesses with many intricate details and well-known characters! 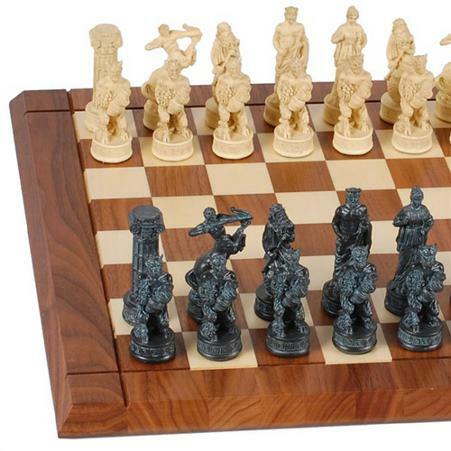 If you have a friend who loves chess, then this interesting chess set might be a nice gift idea. Gods and goddesses played a big part in the history of Greece and many parts of the country can testify to this as there are statues and figures abound. Get nice Chess Sets - Click here! For example the god Pan was reputed to be a half goat/half man who invented the flute. Other Greek gods are the imposing Zeus who is the king of the set and at his side is Hera, queen and wife of Zeus. The castles demonstrate a column of the Acropolis, the meeting place of the Athenians. The knights are represented by a centaur, whose name could be Chiron, who trained Hercules and other ancient Greek heroes. These finely made chess sets are made of poly-resin plastic and are hand-painted using long lasting, lead-free paint. Not recommended for children below 10 years of age since they will break if dropped. Pieces: Hand-painted, non-weighted, plastic resin. I am not sure if this set is always available, just check this store below. They offer a lot of great chess sets.